7 Best place to buy an LS2 crash helmet? 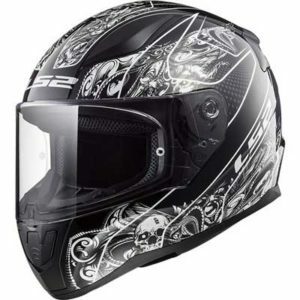 Chinese lid maker, LS2, is known for making lower-priced motorcycle helmets. And because the LS2 Rapid drops in at the lower end of even LS2s already low end price range, you might be a) mega interested in knowing more and b) forgiven for thinking it can’t be much good. But because it’s ECE certified, that means it’s passed exactly the same safety tests as even the most up-market, high price helmets from all the best known makers. 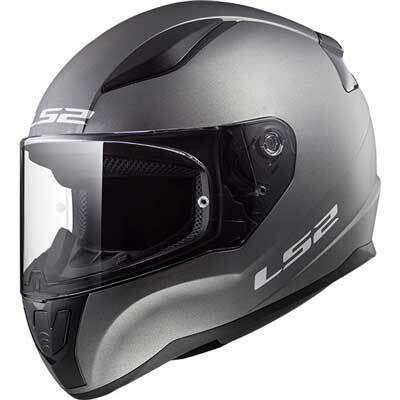 So it also means – on paper at least – that if you’re after a full face helmet for less but want just as much protection as you get from the big boys (and don’t we all), then you could get just as much protection by buying an LS2 Rapid as you would paying out for a helmet ten times the price. In fact they’ve a bit of a track record in confusing us punters, with a few of their other helmets being made, apparently, from kinetic polymer alloys. Thanks again. Sounds like something Iron Man’s suit should be made from (but I guess that’s the idea). Anyhow, there’s nowt wrong with thermoplastic helmets of course; because plastic is a relatively lightweight and strong material that’s reasonably easy to form into the shape of helmets so lots of manufacturers use it. Oh and it happens to be pretty cheap, which is always nice. Inside the shell, there’s a multi-density shock absorbing lining (another good thing) and the whole thing is secured to your bonce using a quick release micrometric ratchet strap. Beyond that, we always look at data from other independent testing outfits; but unfortunately the Rapid hasn’t been SHARP tested in the UK or Snell tested in the US, so it’s tricky to get any further info and find out how well it should actually perform in a spill. OK, so that’s the safety stuff that’s important for the few seconds after everything goes pear-shaped. Now for the features that are gonna help stop you getting in a pickle in the first place. That visor is class A optically correct to give a nice clear view of the road ahead. And it’s also Pinlock anti-mist insert ready. So if you find yourself fogging up all the time, you can buy a Pinlock for the Rapid to cure all your woes. And that’s just what this LS2 does… kinda. But on the Rapid there’s just a couple of holes pushing air directly onto your head without any channels for the air to circulate around. So don’t expect the Rapid to be the coolest, best venting helmet in the world, because it probably won’t be. That visor is a quick release, class A optically correct visor that’s Pinlock ready. If you’re not familiar what what that means, quick release visor means it’s quick and easy to remove the visor without tools – so you can swap it out for a different visor or take it off after a ride to easily clean it. Or you might want to take it off so you can fit a Pinlock anti-fog insert. If you live somewhere cold/wet/humid, you’re gonna need a system to stop your visor fogging up and a Pinlock, that attaches to the inside of your visor, is one of the best. Most helmets come with visors that don’t claim to be optically correct and do a fine job. But if the choice is between having an optically correct visor or one that ain’t, then it’s optically correct every time. And that’s a decent extra for a cheaper helmet. Other than that, the visor’s got a single central opening tab at the bottom of the visor – which should be fine for quickly finding and opening your visor. 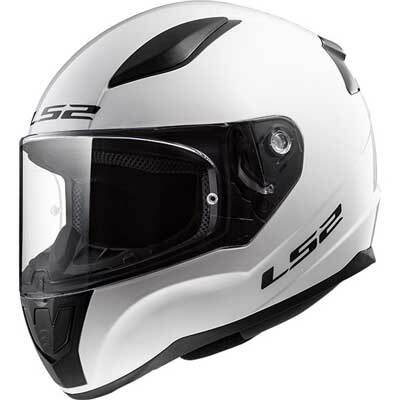 One thing that’s notable with the Rapid though: it’s a lower priced helmet but LS2 has managed to make it a very lightweight helmet (for a thermoplastic helmet that is). In fact, by our reckoning it’s about the average weight for a full on carbon fibre helmet which is pretty astounding! Obv there’s the usual suspects – blacks, whites, greys. But there’s also a fancy lady version – the Poppies (see top image). I say it’s for ladies mainly because that’s the way helmet makers still seem to think. 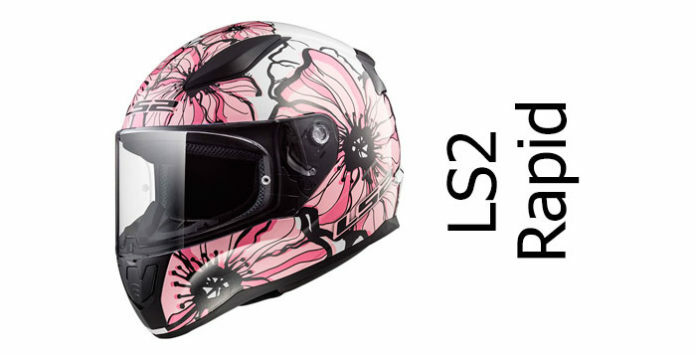 Bung one out there with pink flowers on and that’s it for a helmet that’ll appeal to ladies! Job done. Sheesh. You’ll find a couple of speaker pockets inside the Rapid – vital if you’re wanting to fit a comms system. 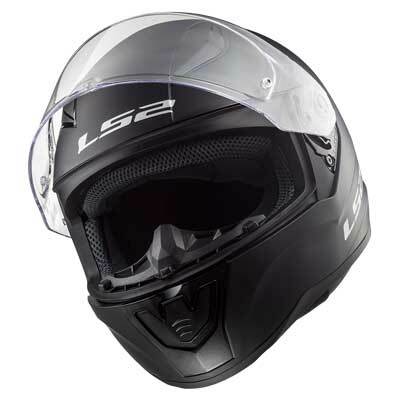 You’ll also find a breath guard and chin curtain in there – good for helping stop your visor fogging up and keeping wind out from below. 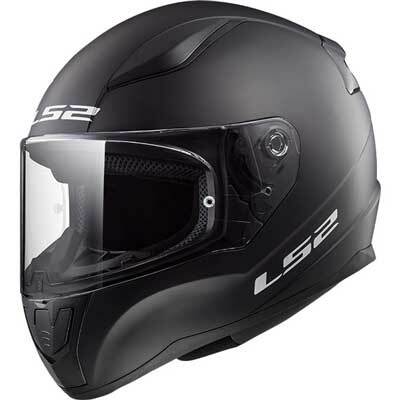 If you’re looking for a helmet that’ll work for your daily commute as well as for longer blasts, then it looks like LS2 has managed to produce a decent helmet that offers cracking value for money. The Rapid is super light weight, has an optically correct, Pinlock ready visor and offers stacks of features that serious riders look for in their helmets – including quick release visor, speaker pockets and removable inner. OK so it’s not been independently safety tested, so all we can really go on is that ECE test/approval and past SHARP scores (which makes us think it should do OK). 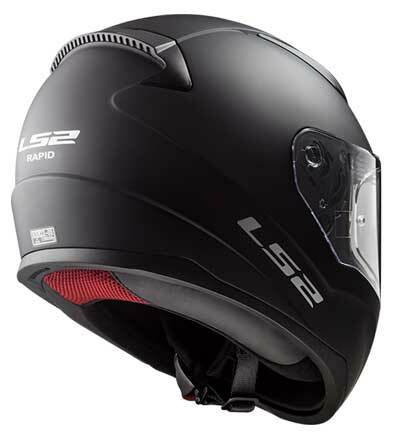 Other than that, if you’re looking for a good all rounder, work horse sort of helmet and if you like value for money – oh, and at this price point you don’t expect the world – then the LS2 Rapid should be a very good buy indeed. First up, there’s the SHARP 5 star rated MT Revenge. It’s pretty basic in terms of features and bells/whistles; but importantly, it should really perform when it’s needed. Plus it looks pretty cool. 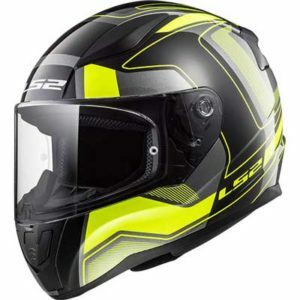 There’s also the AGV K3 SV – that’s 4 star safety rated helmet from one of the safest helmet brands around. It’s got an integral sun visor too, plus it comes with a Pinlock antifog in the box. 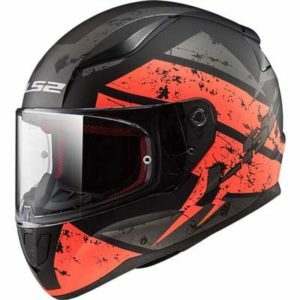 Sharp tested it after this review and has given it 4/5 stars, which is excellent for a helmet in this price range. hmmm. Not as far as I can see. Which URL you looking at? The Rapid is FF353 which hasn’t yet been SHARP tested from what I can see.